Open Road Media, 9781504051996, 874pp. From the #1 New York Times-bestselling author of North and South The first in a saga about a German immigrant and his family's rise in 20th-century America. The tide of the twentieth century is rising upon the world, and on its crest rides the Crown family. Young Pauli Kroner, freshly arrived in America from the streets of Berlin, makes his way to the mansion of his millionaire uncle in Chicago, looking to fulfill his dreams. His uncle, Joe Crown, is a self-made brewery tycoon who rules his domain with an iron hand--especially when it comes to his own family of defiantly rebellious children and a wife yearning for her own liberation. In this new world, Pauli will rise as his own man and find his destiny in the early days of motion pictures. Surrounded by relations close and distant, proud and vengeful, each struggling to find themselves at the dawn of a new era, he will witness and experience the violence of the Pullman Strike, and find love in the arms of a woman who can never be his as he follows the march of history, intertwined with such figures as the audacious Theodore Roosevelt, the ruthless Thomas Edison, the fading western icon Buffalo Bill, and many more. 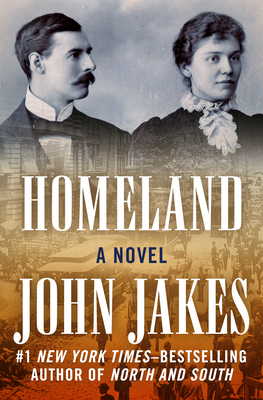 Named a New York Times Notable Book, Homeland is a "first-rate historical . . . chock-full of fascinating period detail, Jakes's] captivating story brings to life the sounds, smells and tastes of turn-of-the-century America in a manner comparable to Michener's Hawaii and Doctorow's Ragtime" (Publishers Weekly). This ebook features an illustrated biography of John Jakes including rare images from the author's personal collection. John Jakes (b. 1932), the author of more than a dozen novels, is regarded as one of today's most distinguished writers of historical fiction. His work includes the highly acclaimed Kent Family Chronicles series and the North and South Trilogy. Jakes's commitment to historical accuracy and evocative storytelling earned him the title of "the godfather of historical novelists" from the Los Angeles Times and led to a streak of sixteen consecutive New York Times bestsellers. Jakes has received several awards for his work and is a member of the Authors Guild and the PEN American Center. He and his wife, Rachel, live on the west coast of Florida.